Home Theater rooms are the spaces where one decorates their room with furniture, television for entertainment, speakers for heavier volume and wall sconces. 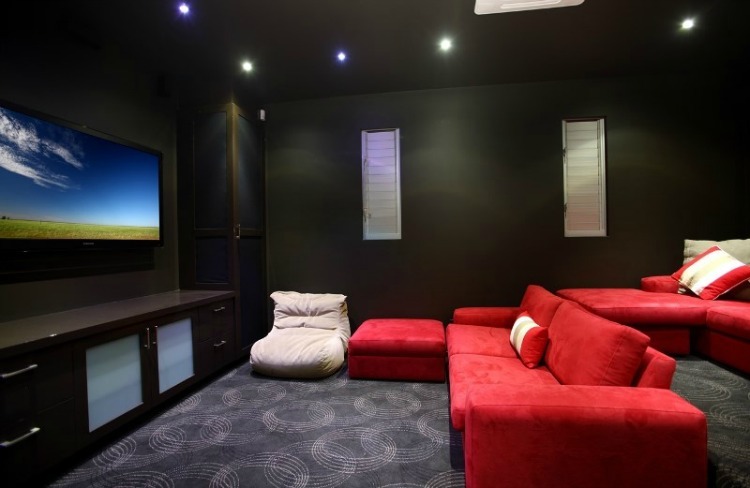 An ideal home theater room is constructed with acoustic panels plastered on the wall and has flooring with thick carpets which absorbs sound. It should be designed with soundproof materials so that it would not create any disturbance to other rooms by the sound. The interior can be decorated with lights which illuminates the room and there will be a video projector attached to the roof so that it enables the image on the screen. 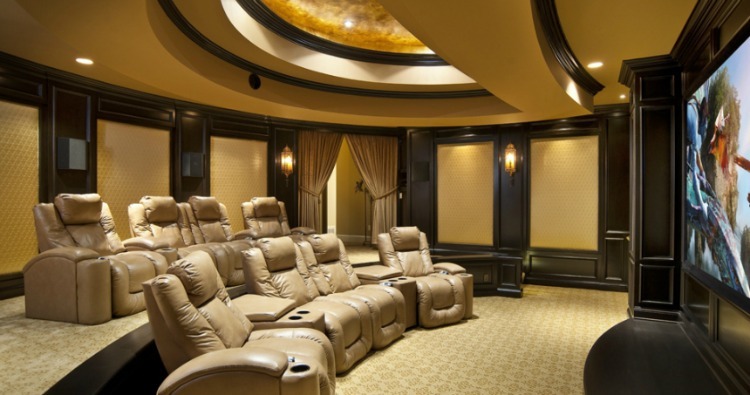 Here are few images of creative home theater rooms which can be useful in designing your interior. In the view of the image you can see a creative style home theater with a classy look. The false ceiling is a drop out ceiling with suspension under structured ceiling with a pendant light and simple light fixtures. The interior has wall cladding made of dark wood on which a large screen television is mounted on it. The room has covered with two finger pleated draperies and the room has mini bar with the cabinets covered with glass doors. It has decorated with wine glasses and has couches for seating. There are coffee tables and foot stools. 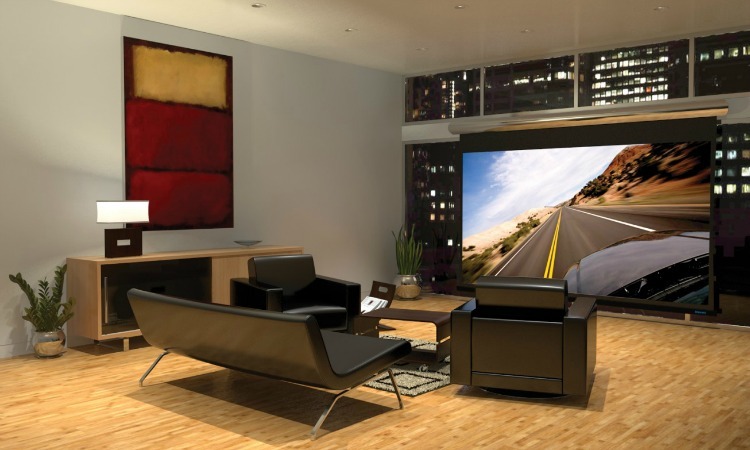 In the view of the image you can see a perfect home theater room which is creative. The interior is decorated with acoustic panels which absorbs the sound and prevents creating echo inside the room. The flooring is made of smooth carpets which are comfy and has timber cladding plastered on the walls. There is a counter top made of marble with wooden legs and has red chairs for seating. It also has smooth leather couches and a large screen LED is attached to the wall cladding. The false ceiling is drop out ceiling with recessed lights and has wall sconces mounted on the wooden cladding. The false ceiling is dry wall ceiling with suspensions of wall and the flooring is textured vinyl flooring. There is a plush carpet laid on the floor which is sprucing the room and has textured wall paper. The room has photo frame mounted on the wall and has a large screen. There is a glass table on the carpet which can be used for serving. The room has yellow leather couches which are eye catching and this type of design can be preferred if you have small space for decorating the interior of the room. In the view of the image you can see a home theater design and has large space. The false ceiling is made of plaster of paris which has suspension and simple light fixtures. The interior is decorated with wooden cladding and has wall sconces attached to it. There are acoustic panels which absorbs the sound and has speakers ascended on the wall cladding. The room has draperies which creates a traditional look and has cabinets to store accessories and has a big screen attached to the wall. The room has many reclining chairs for seating. In the view of the image you can see a inky home theater room. The false ceiling is dry wall ceiling which has wall paper and has recessed lights attached to the ceiling. The flooring is covered with textured grey carpet and the room has cabinets to store accessories. There is a television attached to the wall. The room has a knitted chaise and has red cardinal sofas for seating with cushions and has foot stool. The room is minimal without any extravagant materials and looks beautiful. In the view of the image you can see a home theater room which is open room and has wooden staircase. There is cladding with wood on which wall sconces are mounted and has speakers on the floor. The flooring is made of laminated wood on which a plush carpet is laid and the false ceiling is dry wall ceiling with plain light fixtures. The room has reclining leather sofas for seating and a counter top for serving. It also has chairs and has a television on the wall and has a projector which projects image on the screen. In the view of the image you can see a minimal and creative home theater room. The false ceiling is drop out ceiling with recessed lights and is decorated with a wall paper. The flooring is covered of carpet which absorbs sound and prevents resonance in the room. The room has wall cladding and has acoustic panels which are sound proof. The timber cladding has sconces mounted on it and the room has leather sofas. There are foot stools and has photo frames attached to the wall. There is a LED screen placed on the wooden cladding. The false ceiling is dry wall ceiling with simple light fixtures and laminated hardwood flooring. There are closets for decorative items and has a lamp on it. There are indoor ornamental plants decorated in the room which creates a natural environment. The walls are decorated with ivory white and has a contemporary abstract painting on it. There is a carpet laid on the floor and has a wooden coffee table for serving. The room has a leather sofa with iron legs and chaise lounge for seating. The room has wooden cladding on which a large screen is attached to it. In the view of the image you can see a scandinavian style of home theater room and the false ceiling is dry wall ceiling with plain light fixtures. The flooring is made of carpet which reduces the sound in the interior and a big screen is attached to the wall on which image is projected. The room has cabinets for storing accessories. There are many reclining lounges for seating and has partition to the other room. 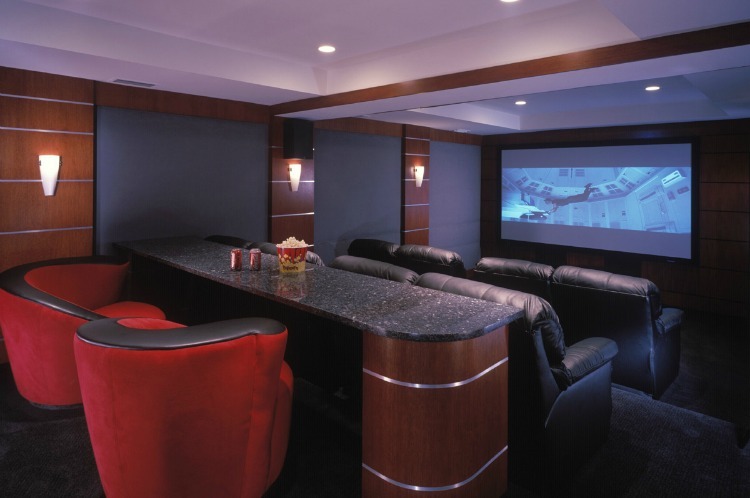 This is a small home theater room and if you like to design a simple interior you can go with these designs. This image views a beautiful home theater room and the false ceiling is made of white ply wood. There are ceramic white tiles and has a plush carpet laid on the flooring. The false ceiling has recessed lights and has glass doors of wooden frame. There is a large screen television in which Yosemite valley image can be seen. The room has two many cabinets for storing embellishments and has closets for placing decorative items. There are speakers for producing more sound and has knitted sofas for seating.